Should Investors Worry About Southwest Airlines? Unit costs are on track to rise a lot more than shareholders expected in 2019. Investors have quickly fallen out of love with Southwest Airlines (NYSE:LUV) stock over the past few weeks. Initially, they may have been concerned about rising fuel prices. However, investors got even more worrisome news in Southwest's recent third-quarter earnings report, as the airline revealed that nonfuel unit costs are on pace to rise at least 3% next year. This outlook runs counter to the more benign nonfuel cost trends that most U.S. airlines have been seeing recently. 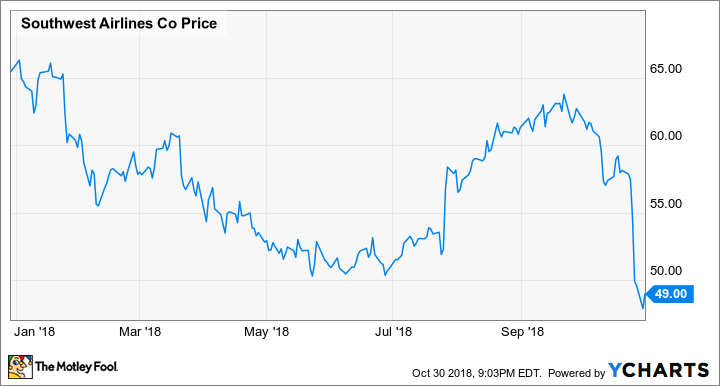 As a result, Southwest Airlines stock has plunged from above $60 in the first week of October to less than $50 near the end of the month and is now down 25% year to date. Southwest Airlines Year-to-Date Stock Performance, data by YCharts. Despite the cost pressure, Southwest Airlines hopes to achieve another year of earnings growth in 2019. Let's see if investors have anything to worry about. From late 2016 through the end of 2017, Southwest Airlines faced significant pressure on its nonfuel unit costs due to rising labor costs and accelerated depreciation on older-generation Boeing (NYSE:BA) 737s that it retired last year. This drove a 4.9% increase in Southwest's nonfuel unit costs (excluding special items and profit sharing) in 2017. Those headwinds disappeared by the end of last year. As a result, the carrier's adjusted nonfuel unit costs are on track to rise no more than 1% in 2018. Most investors likely expected a similar increase next year, but certainly no more than 2%. However, Southwest Airlines revealed in its third-quarter earnings report that nonfuel unit costs will be up at least 3% next year. CEO Gary Kelly stated during the subsequent earnings call that the carrier is seeing a variety of normal inflationary cost pressures, including annual raises for its employees, higher technology and infrastructure investments, and rising maintenance expenses. What's unusual, according to Kelly, is that Southwest doesn't expect to achieve the level of productivity growth that would offset those headwinds in 2019. Southwest is working hard to get its cost trajectory back on a better track by 2020, but management has made no promises. Over the past several years, one of the main productivity drivers for Southwest Airlines has been the rapid retirement of its Boeing 737 Classic fleet and its replacement with Boeing 737-800s. Fleet renewal has been the key to Southwest's productivity growth. Image source: Southwest Airlines. The Classics had between 122 and 143 seats each, whereas the 737-800s are outfitted with 175 seats. Yet there was very little difference in their operating costs, which meant that upgrading to the 737-800 unlocked substantial productivity gains. The Classics have all been retired now, so Southwest's fleet-related productivity growth has slowed. However, Southwest Airlines will probably retire the first of its more than 500 Boeing 737-700s within the next year or two. Half of that fleet or more is likely to come up for replacement over the next decade. Like the majority of the 737 Classics, the 737-700s are configured with 143 seats. Nearly all of these planes will be replaced over time with 175-seat 737 MAX 8s. Southwest currently operates a handful of 737 MAX 8s, but it expects to add at least 225 more to its fleet between 2019 and 2025. It also has 115 options for the 737 MAX 8 with Boeing. The addition of the 737 MAX 8 to the Southwest Airlines fleet is already driving fuel-efficiency gains, but a higher rate of aircraft replacements will be the key to sustainable productivity improvements. One other interesting (and thus far unresolved) question is whether Southwest might convert some of its 737 MAX 8 orders to Boeing's larger 737 MAX 9 or 737 MAX 10 models. Such a move would unlock further productivity growth opportunities. For now, Southwest Airlines' fleet-related opportunities to offset its unit cost inflation are just that: opportunities. The good news for investors is that the carrier's unit revenue is heading in the right direction. While revenue per available seat mile (RASM) declined 0.7% in the first nine months of 2018, the company's guidance calls for RASM to rise 1% to 2% this quarter. Looking ahead to 2019, Southwest Airlines will face easy revenue comparisons for most of the year. It will also continue to capture upside from various revenue-boosting initiatives. That's why management is cautiously optimistic that RASM will increase at least 3% next year. RASM growth of 3% to 4% would hold Southwest's profit margin roughly steady in 2019, barring a huge increase in fuel prices. If all goes well, the company's cost creep will moderate in the years thereafter, enabling further earnings increases even with slower RASM growth. Investors should keep an eye on Southwest Airlines' profit trajectory, but there's no reason to panic yet.